Northern Virginia offers the culture of two different worlds combining cosmopolitan skylines and country star-lit skies. Northern Virginia, commonly referred to as NOVA, is next door to our nations capital - Washington, D.C. - yet has kept its own character reminiscent of colonial times, rambling plantations, equestrian farms and cobblestoned streets leading to quaint taverns, chic shops and historical gems. Northern Virginia comprises several counties and independent cities in the Commonwealthof Virginia including Arlington, Alexandria, Fairfax, Falls Church, Tyson Corner, Reston and Vienna. With 2.8 million residents (about a third of the state), it is the most populous region of Virginia and the Washington metropolitan area. Northern Virginia is a favorite destination of shoppers, from upscale shopping malls to bargain outlets and winery shops. 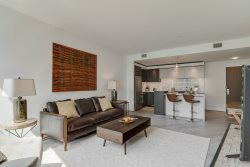 Dwel has a reputation for providing the best furnished apartments in the D.C. Metro area. Our Featured listings are some of our true gems!